As with practically every year, the economy is crucial to this year’s election for governor. Although Michigan’s economy has gone gangbusters since 2011, experts warn the sustained period of growth likely won’t last. And the revival includes troubling spots, such as stagnant wages and moribund growth in northern Michigan and regions including Saginaw, Flint and Bay City. What is your plan to help Michigan’s economy? Can/should the governor help diversify the economy? What can government do to attract jobs? How can the government jumpstart areas, particularly rural ones, that aren’t growing as fast? Most of the candidates did not answer all the questions and instead repeated their philosophies about government and jobs. Bridge asked them to limit their responses to 300 words. Their responses were edited for length and clarity. Lieutenant governor, Calley is running largely on his legacy, pointing to tax cuts and investments that grew the economy by 15.4 percent since 2011, when term-limited Gov. Rick Snyder took office. Calley is pushing Snyder’s “Marshall Plan for Talent,” which would spend $100 million on scholarships, childcare and school programs to help grow fields such as computer science and skilled trades. The plan encourages competency-based certification, assistance for schools to improve curricula and classroom equipment and supports career navigators and teachers. “Calley will help fill more than 800,000 jobs in technical, professional and skilled trades field by 2024 by connecting Michiganders to these careers with innovative programs,” said campaign spokesman Mike Schrimpf. “The best way for government to ‘jumpstart’ economies ... is to get out of the way so business can innovate, grow and create jobs,” Colbeck said. Colbeck opposes government subsidies, excessive regulation and economic policies that “pick winners and losers.” He proposes gradually eliminating the 4.25 percent state income tax and pension tax by changing how the state delivers Medicaid and saving money on roads by investing in paving technology that extends their lifespans. A Saginaw-area doctor, Hines did not respond to Bridge’s requests for information. He is pushing a plan he calls the “Paycheck Agenda” to grow all sectors of the economy by rolling back former Gov. Jennifer Granholm’s “temporary” increase of the state income tax to 4.35 percent from 3.9 percent. He also pledged to encourage job training among students to fill jobs and said “improving grade school reading is an absolute priority,” but he didn’t specify how he would do so. An Oakland County former executive for Xerox, Cobbs says he would grow the economy with a $60 billion infrastructure replacement program that would be repaid through a 30-year bond. “That program would deal with infrastructure from one side of the state to the other. It would give us the opportunity to put any Michigander who wants to work in a job for the next 25 to 30 years,” Cobbs said. The former director of the Detroit Health Department, El-Sayed favors boosting the minimum wage to $15 and shifting public support from big corporations to small businesses. 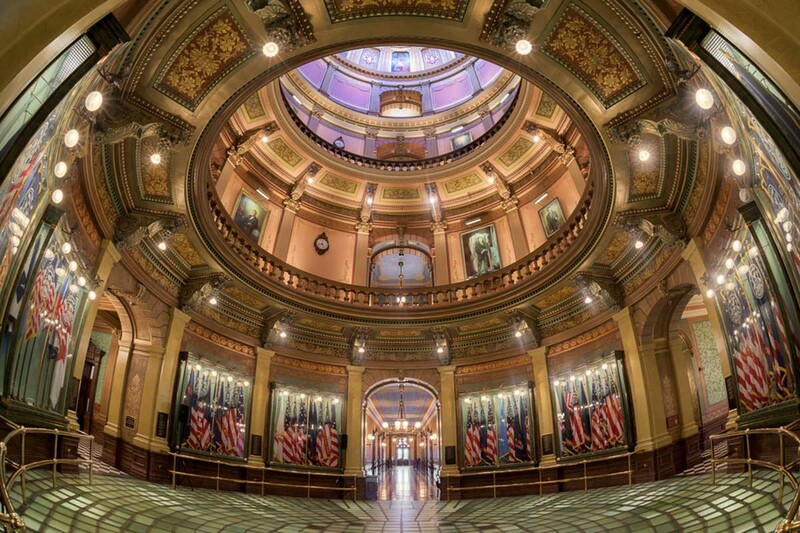 "For too long, Michigan has played by the same script: provide massive corporate tax cuts to big corporations, and then watch as the jobs that they promised disappeared because they were offshored or automated,” El-Sayed said. El-Sayed said he plans to review and streamline Michigan’s regulatory codes, reinstate grants for mid-career job retraining, expand vocational education and guarantee access to tuition-free education for children of families that make less than $150,000. He said he also would invest in affordable housing, encourage the development of light manufacturing and help grow agriculture by helping create programs that would connect small farms with craft businesses. An entrepreneur and former owner of a chemical testing laboratory, Thanedar says he would reform the Michigan Economic Development Corp. to support small businesses rather than corporations. “To jump start our economy, I plan to increase support for entrepreneurs who want to create jobs, create tuition incentives to keep more college graduates here, with even bigger incentives if they also create jobs,” Thanedar said. He said he also would demand companies return tax incentives if they don’t deliver on promised jobs; invest in universal wireless; move to a graduated income tax system; increase the minimum wage to $15 an hour; enshrine collective bargaining rights into the state Constitution and increase access to affordable child care. Whitmer, the state’s former Senate majority leader, says she soon will release her jobs plan so more people can “participate in our state’s so-called economic comeback,” which she says requires families to work multiple jobs to make ends meet. Whitmer says she would help diversify the economy by partnering with research institutions, expanding broadband internet to rural areas, and improving everything from roads to the Soo Locks. Ah...the "living wage" argument for "boosting" Michigan's economy..
Now I see why the democratic establishment has shunned the other candidates for Whitmer. Putting more people on UI is a great way to boost Michigan's economy. I had to leave my hometown of Battle Creek 15 years ago due to no prospects in the work field. I am one of many successful business people pushed away from home because of wrong leadership. I am watching and hopeful that Michigan will reflect and place people in leadership that care about people again! People are our asset, and people need to help people not corporations!!! I will only vote whoever eliminates state employee pension tax. I think a lot of us agree with you on this and it would be a winning policy position. Are there any candidates who explicitly claim to be for repeal of state employee pension tax?